Remember all my hoopla about King of Mods and Goth Juice? No? Click here to read up! My original blog post about King of Mods and Goth Juice was quite popular and many of you had bits to say so today I bring you a blog of review! 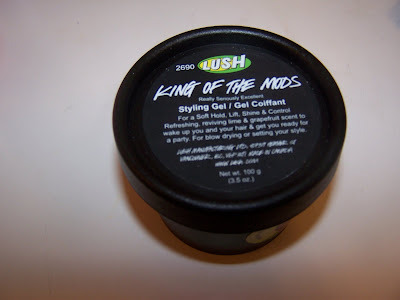 I got my package from Lush UK last week and inside was my new favorite product King of Mods! Lush introduced it’s hair gels in the Summer I believe or maybe it was the Spring but either way for some reason or another I never really got around to buying or trying any! I’m happy to say that King of Mods is fantastic! What’s so fab about King of Mods? For one thing the smell is amazing! It’s this uber bright cocktail of lemon, lime and grapefruit (real deal here!). It’s tart and fresh and just beautiful! Words can’t really describe how yummy this smells and when it’s in your hair the scent just lasts and lasts all day long! If you happen to be a long time Lush user you’ll remember a lovely little product by the name of Back for Breakfast which is sadly gone. King of Mods smells almost identical to Back for Breakfast! I’m actually currently, with much sadness, using my last bottle of Back for Breakfast and the scent of both King of Mods and it in my hair is just too gorgeous! King of Mods also quite reminds me of the smell of Ocean Salt but the lime is a bit more prominent in Ocean Salt while in King of Mods the lime takes a back seat to the tart sweetness of the lemon! A little goes a long way. Don’t say I didn’t warn you. A tiny drop rubbed between the palms of your hairs and smoothed into wet hair is plenty to get you through the day! I personally wouldn’t attempt this on dry hair but from what I’ve read people have had great results using it like that. Lush promotes this as a soft hold hair gel but I get more of a strong hold from it. It eases the frizz that my heavy, wavy hair is quite known for and also makes my hair feel quite soft and of course nicely scented! The scent just lingers and lingers and lingers and believe you me I’ve had many compliments about how fresh smelling my hair is! This is a very light gel contrary to it’s texture. 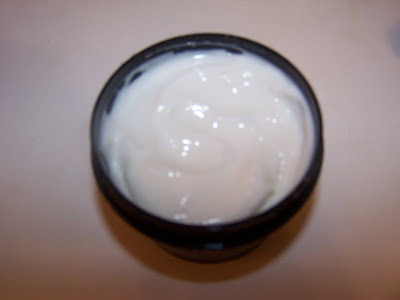 The texture is a bit sticky and dense and it takes some work smoothing it between your hands for application but when it’s in your hair it’s very light so you won’t end up feeling like a helmet head or having a greased up look. I use it on my wet hair and I’m not one for blowing dry so when my hair finally dries it feels very fluffy while easing my frizzes! As you already know my uniform is placing my hair in a bun and smoothing my hair back with a headband. My hair is wavy and full of curl and placing it back keeps it away from my face while I’m working. By the end of the day my emaculate hair ends up spiraling out of it’s bun and I have a case of the frizz on the halo of my head! Lucky enough I now have King of Mods which pretty much holds it all together. The price tag on King of Mods could make you wince. Stateside a small jar costs $15.95 but I’m here to tell you it’s cash well spent. This jar will last you ages because as I said before a tiny drop is all you need. I figure I could get at least 6 months or more from this jar so at $15.95 that’s not too bad a deal! If you’re yearning for some Back for Breakfast now and you’re wondering what would go well with the fresh smell of King of Mods have no fear your Muse has several products that’ll go perfectly with the amazing scent of King of Mods that she’ll bring to you in her next blog post! I can’t say enough good things about this cute little pot of gel especially can’t stop raving about it’s gorgeous smell. King of Mods is most definately Muse Approved for purchase! I use their hair gel every time I wash my hair !! 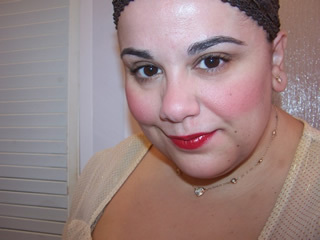 I totally agree that it is great for controlling frizz. The one I get is the other one which is called The Big Tease” as it’s the strongest hold one. And it’s brilliant for my thick hair. Gets rid of frizziness 100%. Smell is divine and next time I’ll have a smell of the one you got – they might have the same smell. I remember they had three different hair gels but seem to have only two now? Maybe the third one was the one you mentioned Back for Breakfast. The gel is expensive for a hair product but definitely worth every penny. I can’t be without it !